I love cake balls. But I don’t like making them. Making and forming the cake balls themselves isn't hard but dipping every stinkin one of them in chocolate is. And it’s messy. Ain’t nobody got time for that. So when my friend, Dawn brought me some “cupcake truffles” from a local cupcake bakery, I was blown away with what they’d done. Instead of dipping each ball (which I'm sure was what became of the day-old cupcakes) in chocolate or some other coating, they’d simply rolled each one in sprinkles. Flip. In. Brilliant. I’d been wanting to make some for a while so when October arrived, I decided to make my first batch pink in honor of Breast Cancer Awareness Month. 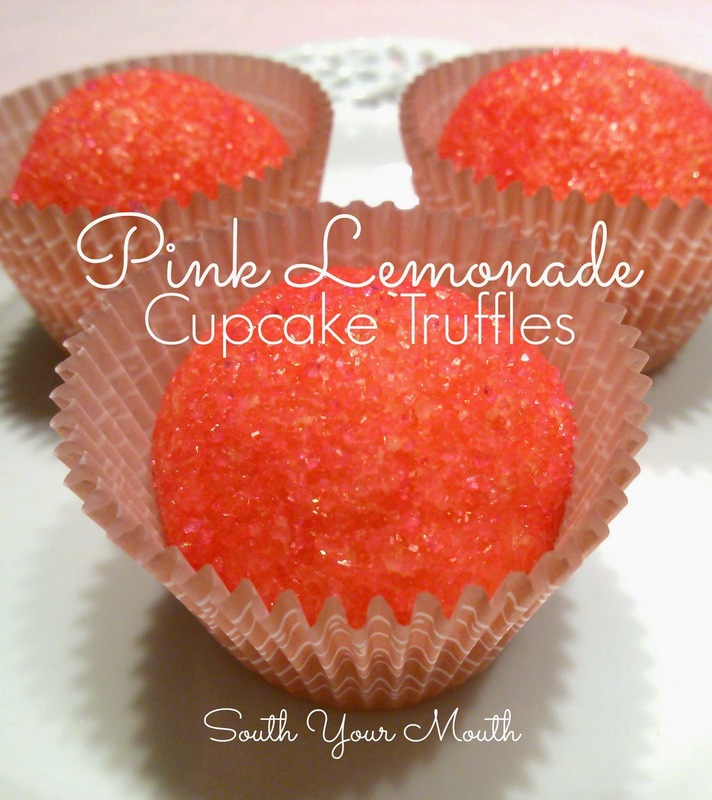 And thinking “pink” lead me to pink lemonade and that’s how I landed on these. P.S... these would be darlin at a baby shower! And if it's a boy, use blue sugar sprinkles and call them 'Electric Lemonade' Cupcake Truffles. Make cake per manufacturer’s instructions for a 13x9 pan, substituting water with lemonade. Allow cake to cool completely. Trim off the thin golden brown top and edges of the cake (you can leave the bottom be). This step is optional but removing the brown top and edges yields a brighter yellow cake ball batter. Break cake into pieces and add to a large mixing bowl or stand mixer. Add frosting and mix on low speed with an electric mixer (use paddle attachment if using a stand mixer) until thoroughly combined and smooth. Cover and refrigerate “batter” for 4-6 hours. Once batter is cold and firm, form into small balls. I used a cookie scoop to ensure each one was uniform in size (this is cookie scoop I use). Roll each ball in sugar sprinkles. Store in refrigerator. When do you use the lemonade and the frosting?? what do you mix with the cooked cake?? i am lost?? All cake mixes (at least every one I've seen) call for water to be added when making the cake. Substitute lemonade for however much water the manufacturer's instructions call for. Mix the frosting with the cooked, cooled cake. You make the cake mix as directed, except you substitute the lemonade for water (on the cake box directions.) You mix the frosting with the cooked cake, then chill, form into balls, and roll in the pink sugar. Can you tell me how many truffles this made? Thinking of making them for a silent auction item. Oh gosh, I guess about 45-50 balls a little less than 1.5" in diameter. I didn't even think to count them! I made a version of these today with my daughter and her friend. I made mine with chocolate cake (minus the lemonade), and rolled them in different colors of sugar. I tried making chocolate covered cake balls with my daughter before but it was a huge bust, and way too time consuming (never mind the fact the Pyrex bowl full of melted chocolate exploded). This worked so well, thank you for posting this recipe. We had a "South Your Mouth" day, and made these, your Tuscan Chicken soup and Mama's Pudding pie. They were all awesome!! Thank you for all the great recipes. Every single one I have made has turned out excellent! Melissa, I want you to know that you warmed my aching heart with this! I was just up in Canada on a trip without my kids and was feeling very blue missing my babies and read this and it helped me feel better. So, thank you for that! I'm so glad y'all had fun making these and had a whole SYM day! That's awesome!! Thank you for taking the time to let me know. I've made something similar to these but instead of sugar, I dipped them in melted almond bark. After a couple of times, I learned to just use a cookie dough scoop and not even form to a ball. They are so yummy and everyone will ask for them.